I am all about festivities and family tradition. I'm the one who gets excited just after Christmas when the Easter hot cross buns and chocolate eggs start popping up on supermarket shelves. I often listen to people complaining about how it's too soon 'We only just had Christmas' they say. Not for me. I couldn't be more excited. For me, Easter represents a lovely time of the year where we get together as a family, usually at my Nan's place. It involves laughs, great food, love and of course a little chocolate. This year is extra special as it will be William's first Easter and whilst he is a little too young at the moment to get excited about what it all means and the childish excitement that comes from believing in the Easter Bunny, it's still going to be a fun day. One thing that I really enjoy eating over the Easter period are hot cross buns. Traditionally served hot or toasted on Good Friday, these delicious delights are now available throughout most of the year. Over the years, several variations have become increasingly popular. Whilst I am a stickler for tradition and love the old fashioned traditional spiced ones studded with fruit, I have become quite fond of the chocolate version. 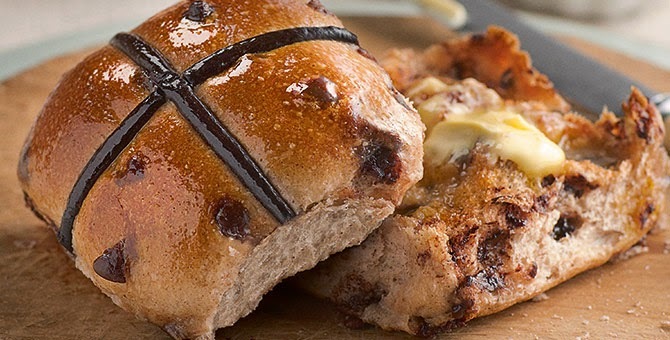 Incredibly indulgent, it combines two of my favourite Easter foods - chocolate and hot cross buns. 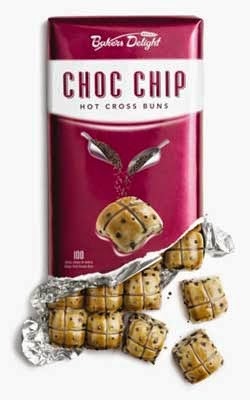 This year Baker's Delight has four delicious hot cross bun flavours on offer - Traditional, Fruitless, Mocha and Chocolate Chip. Well HELLO there Chocolate Chip! Served hot, slightly toasted and smothered in butter is the best way to enjoy these beauties. Tell me, how do you enjoy your hot cross buns? Wishing you all a wonderful and safe Easter. The Food Mentalist sampled the above mentioned hot cross buns compliments of Bakers Delight.